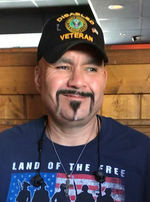 On Sunday March 24, 2019, Ronald Torres, husband and loving father of five children, passed away at the age of 50. Ronnie was born on November 29, 1968 in Las Cruces NM to Dorothy (Torres) Arguello and Manuel Rodriguez. He joined the Army National Guard in 1986. Ronnie had a passion for sports, he especially loved to hunt. He was an Army veteran who was proud to serve his country. Ronnie’s other passion was his daughters, he always wanted to ensure his girls could be given the opportunity to be the best they could be. Although he met his son at a later time he always made his children his priority. Ronnie was a caring man who stopped what he was doing to offer support and helped those he cared for in any way that he could. He was known for his kind and compassionate spirit. In addition, he helped his mother out every season on home and yard maintenance. He took every opportunity to be a part of his nieces and nephews lives and celebrating their success. These are just a few of the many kind acts Ronnie did. Ronnie was preceded in death by his father, Manuel, his step father Cipriano Arguello Jr. and both his paternal and maternal grand parents. He is survived by his wife Flora, his five children, Rachel, Sylvia, Stephanie, Elizabeth and Ronald Jr., his mother Dorothy Arguello, brothers Matthew Arguello, Manny Rodriguez, Adam Rodriguez and two sisters Sonia (Arguello) Rodriguez and Bernadette Arguello, several uncles, aunts, cousins, nieces, nephews and an abundance of friends. Services will be held on Tuesday, April 23, 2019 beginning at 10:00 am at The Cathedral of The Immaculate Heart of Mary, with a mass to follow at 10:30 and burial to immediately follow at St. Joseph's Cemetery. To send flowers to the family of Ronald P Torres, please visit our Heartfelt Sympathies Store.